The information below is derived from many sources; major reference texts are listed at the foot of the page. Born in Plymouth on 28th January 1916, Peter Darbishire Orton was the son of marine scientist Prof. James Herbert Orton. Peter Orton studied Natural Sciences, Music and History at Trinity College, Cambridge, receiving his degree in 1937. Orton's early professional career was as a music teacher in Surrey, England, but later, in Perthshire, Scotland he broadened the scope of his his teaching to include biology and English: an amateur interest in fungi and his experience writing on that subject must have been key driving influences in that decision. P.D. Orton gained considerable expertise in identifying agaricis in particular, and in 1955 he took time out from his teaching work to assist Dr R.W.G. Dennis, head of mycology at the Royal Botanic Gardens, Kew, and F.B. Hora at Reading University. In 1960 Dennis and Hora produced a revised checklist of British agarics and boletes. Orton's main contribution was a 300-page Notes on Genera and Species, which included descriptions and line drawings of many new species. Woodland fungi in particular held a special fascination for Peter Orton, who became the leading British authority on the vast and challenging genus Cortinarius, for which he published a series of identification keys. On retiring from teaching, Peter Orton moved to Crewkerne, in Somerset, where he continued his mycological studies and publications. He died there on 7th April 2005. P. D. Orton's contribution to mycology is recognised in the scientific naming of at least two agaricoid species in his honour: Cortinarius ortonii Moënne-Locc. & Reumaux and Entoloma ortonii Arnolds & Noordeloos. The standard author abbreviation P.D.Orton is used to indicate Peter Darbishire Orton as the author when citing a mycological name. Dennis, R.W.G., Orton, P.D., & Hora, F.B. (1960). New checklist of British agarics and boleti. 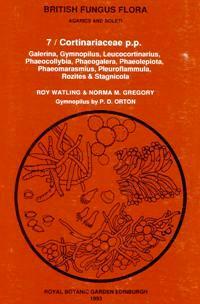 Supplement to Transactions of the British Mycological Society. Orton, P.D. (1986). British Fungus Flora 4. Pluteaceae: Pluteus & Volvariella. Royal Botanic Garden, Edinburgh. Watling, R. Gregory, N M & Orton, P D, (1993). British Fungus Flora, Part 7: Cortinariaceae (Orton contributed the Gymnopilus section). Royal Botanic Garden, Edinburgh. The National Archives (UK) .